With Indian community leaders raising the issue over the years, and after many rounds of discussions between the Ministry of External Affairs, the Ministry of Civil Aviation and Air India, a solution has finally been arrived at. For many Indian families whose loved ones died in foreign shores, transporting the mortal remains was a harrowing experience — not only did it take time, but it was also very expensive. The challenge was acute in the Middle East, where the Indian population has grown to almost 80 lakh, with a majority being blue-collared workers. Official estimates show about 10 Indians die in this region on an average every day, mostly due to natural causes and in road accidents. But with Indian community leaders raising the issue over the years, and after many rounds of discussions between the Ministry of External Affairs, the Ministry of Civil Aviation and Air India, a solution has finally been arrived at. The government has reached an understanding with Air India that a “flat rate” will be charged from families of the deceased. To begin with, it has negotiated the rate for the six Gulf countries (see box), where the estimated Indian population is significant: UAE (33 lakh Indians), Saudi Arabia (27 lakh), Kuwait (9 lakh), Oman (8 lakh), Qatar (6.5 lakh) and Bahrain (3.5 lakh). 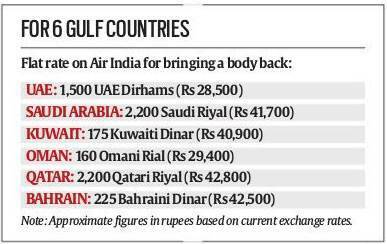 Officials said the “flat rate” — for Air India direct flights from earlier this month — is almost 40 per cent lower than the average cost of transfer of bodies from these countries. The transport of bodies of children — less than 12 years old — will cost half the flat rate, officials said. According to officials who briefed NRIs on this move at the Pravasi Bharatiya Divas held in Varanasi last week, the transfer of bodies is a “key priority” for the Ministry of External Affairs to make this cheaper, easier and hassle-free. From 2016 to 2018, the government paid for 486 transfers of mortal remains for the poor and needy, which cost the state exchequer Rs 1.6 crore. Officials said airlines would usually charge by weight — the more a body weighed, the higher the cost. On an average, transferring each body could cost anywhere between Rs 50,000 to Rs 1 lakh, sometimes, even more, they said. Officials said the airlines would also charge more since the coffin could not be kept with the luggage of other passengers in the cargo hold in order to “maintain the dignity of the mortal remains and keep in mind the sensitivity of the passengers”. “So, the steep charge also took into account the empty space around the coffin in the cargo hold,” an official said. According to official data, remittances worth around USD 37 billion come from Indians in Gulf countries out of a total USD 69 billion from all over the world.